Dan Wallace hopes to make his family and friends proud this summer by winning an Olympic medal as part of the Team GB swimming squad in Rio. 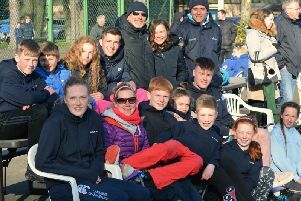 The 23-year-old, who began his swimming career at Duns Amateur Swimming Club whislt attending Chirnside Primary School, was one of three ‘wildcard’ picks by coaches after he missed the Olympic qualifying time. Dan is one of eight Scottish swimmers out a team of 26 named to go to Rio de Janeiro this summer to compete for Great Britain. Studying on a sport scholarship to the University of Florida, Dan now trains with the Florida Gators, coached by Gregg Troy, and is the only Scottish swimmer selected for the Rio Olympic Games who does not train in the UK. Dan believes that the time is right for him to compete for Great Britain in the Olympic Games. The Commonwealth gold medallist and 2015 world champion will not be the only Duns ASC alumnus to fly off to Rio this summer. Ben Higson, who works as a coach at the University of Stirling and is originally from Coldingham, has been selected to be a pool-side coach for the games. Duns ASC has a history of producing world class swimmers including double silver Commonwealth medallist and 2012 Beijing Olympian Euan Dale (30) from Abbey St Bathans. Speaking about what first inspired him to take up competitive swimming, Dan named his mother, Tanya, as one of his biggest influences over the years. As a child, he soon found a passion for competitive sports. Dan said that he takes his motivation from seeing how far he has advanced in the sport, how his successes inspire people and how proud his family and friends are of him. The first swimming heats of the Rio Olympic Games are scheduled to take place on August 6 at the Olympic Aquatics Stadium in Barra da Tijuca.